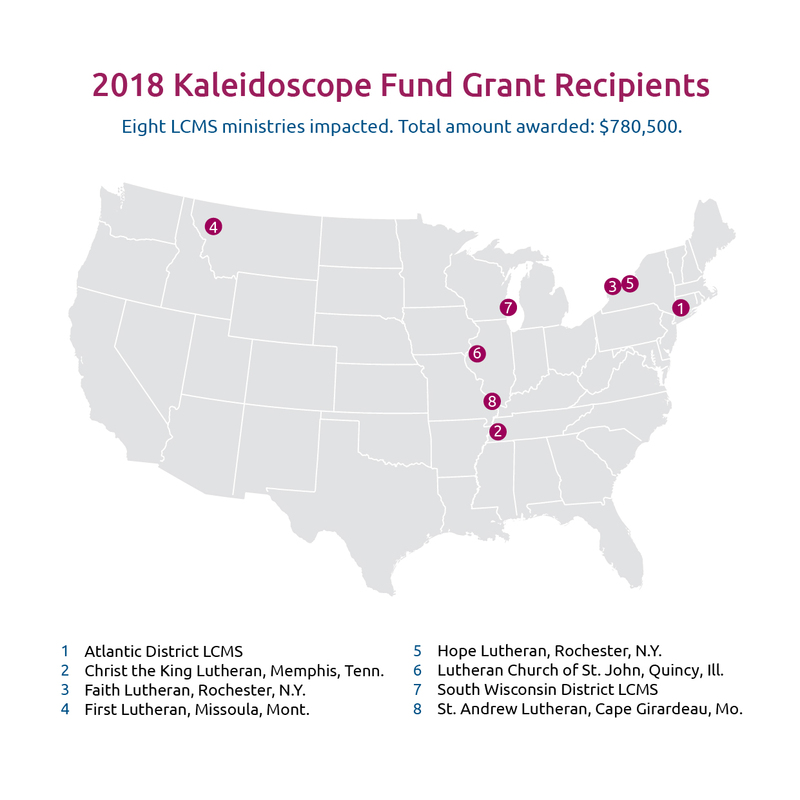 In early October, Lutheran Church Extension Fund (LCEF) announced the 2018 grant recipients of the Kaleidoscope Fund, a granting program established by LCEF. “This was, as it always is,” said Susan Schaefer, LCEF assistant vice president-Executive Office, “a task steeped in prayer by a committee of dedicated volunteers.” After a full day of deliberating, the fund awarded a total of $780,500 to eight Lutheran Church—Missouri Synod (LCMS) ministries throughout the United States. Atlantic District LCMS: Create new ministries that engage the unchurched in the Atlantic District with the Gospel. Christ the King Lutheran Church, Memphis, Tenn.: Start a ministry that uses the church to give shelter, feed and share the Gospel with the homeless. Faith Lutheran Church, Rochester, N.Y.: Expand a ministry for chaplains to assist first responders. First Lutheran Church, Missoula, Mont. : Complete garden and livestock area to raise food for an orphanage in Mexico. Hope Lutheran Church, Rochester, N.Y.: Expand established food pantry into community care center to meet the physical, emotional and spiritual needs of working poor in Greece, N.Y.
Lutheran Church of St. John, Quincy, Ill.: Start a mobile food pantry for small rural communities within 75 miles of Quincy. South Wisconsin District LCMS: Renovate the chapel space for prison ministry at the Milwaukee County House of Corrections. St. Andrew Lutheran Church, Cape Girardeau, Mo. : Expand a coffeehouse ministry that nurtures the local community and college students. Consistent with LCEF’s mission, the committee selected ministry ideas that are related to the expansion, enrichment and energizing of Christ’s Church. Join us as we congratulate the 2018 recipients and prayerfully support their endeavors to proclaim the Good News of salvation in Christ, our Lord.